YEA Camp was one of the best weeks of my life. I honestly do not have anything negative to say about it! On my application for PETA2’s Youth Advisory Board, I was asked “What is the coolest thing you’ve ever done?” And I said YEA Camp! Because where else do you have the opportunity to be with other like-minded people, eat AMAZING vegan food, and learn how to be an effective activist, all at the same time? Even though I was one of the oldest campers, I was constantly being inspired by ALL of the other kids; it did not matter if they were 11 or 17. What all of them had accomplished even before camp was moving, and what they had planned for after camp was just exhilarating to hear about. The community was full of positivity- no bullying, no gossiping, people would not even let you put yourself down! The counselors were wonderfully diverse, yet they were all brought together by their passion for activism. For every topic there was a counselor that specialized in it, which meant that we got to create our IOIs (Issue of Importance) with someone who had firsthand experience in that area. Our relationship with our counselors continues to flourish because they stay in touch with us, giving us connections related to our campaigns, telling us about events we may be interested in, and providing support, because being an activist is not always easy. We had several workshops every day, and they were all extremely interesting and informational. My favorite one was about intersectionality, because it’s important to realize how all areas of injustice connect in some way. I actually replicated it when I got home in my environmental club at school! We learned about campaigning, which was helpful because I had no idea there was a right and wrong way to passing out leaflets! There were also two workshops dedicated specifically to racism and gender, because being knowledgeable about these issues is helpful no matter what area of activism you want to go into. We talked about school clubs (which gave me many ideas for the environmental club that I had just started) and nonviolent communication (which is beneficial to ALL aspects of your life — not just activism!). It was also evident that the staff cared about us as people, not just as activists. The most vivid memory I have of camp was being asked to write down the raw emotions behind and about the causes we care about. Why do we care about the issues that we do? What makes us so passionate? These were all questions that we were told to ponder while writing our responses. When we were finished, everyone’s reflections were read anonymously. Many tears were shed, but the support we received for sharing these more hidden parts of ourselves was immense. Towards the end of the week, we had our YEA Show, where we had the opportunity to share talents or projects or anything that we wanted to show that we hadn’t yet that week. Sometimes the acts were goofy (I did a trio with two counselors, me on piccolo, one of them on flute, and the other on an Indian flute, where we performed a silly rendition of “Mary Had a Little Lamb”), and sometimes they were extremely deep (campers and counselors alike shared powerful poetry about activism). The best part about this night was that EVERYONE got a standing ovation. We did this for two other events as well — when we were telling everyone about our action plan (what we wanted to do with our IOI after camp) and when we were doing a public speaking activity. How amazing it feels to be only a senior in high school and have already received three standing ovations in my life. There is nothing that boosts your confidence more than that! The staff also made sure that we accepted the applause, because even though it may not seem like it, learning to embrace people’s appreciation for you is just as crucial as anything we learned in a workshop. The food was exceptional, and it was incredibly exciting to find out that several campers, who had come to the camp for issues other than animal rights, decided to go vegan after camp! It definitely demonstrated that many people will find that vegan food is amazing and that maintaining a vegan lifestyle is totally possible, if they are just presented with some good vegan food to try! Some breakfast foods included French toast, breakfast sandwiches, and pancakes; some examples of snacks were watermelon, popcorn, and hummus; lunches were anything from veggie burgers to pizza to grilled cheese; our amazing dinners were usually some sort of ethnic food — Mexican, Indian, and Chinese to name a few; and every night ended with a dessert such as brownies, cookies, or cupcakes. Plus, our cooks were especially talented in accommodating dietary needs people had, like gluten-free, berry-free, and soy-free. They also pride themselves in cooking with organic and local ingredients as much as possible. No one ever went hungry that week! We were very fortunate at our camp specifically because we had the opportunity to stay on the new location of Woodstock Farm Animal Sanctuary. Almost every day we had the chance to spend some time with the sweet rescued creatures. There were cows, pigs, goats, sheep, chickens, turkeys, guinea hens, and ducks. I had never been to a sanctuary before, and it was deeply beautiful to be able to pet — or even snuggle up with — the animals that I am dedicating my life to saving. Several of us even got to volunteer for a bit by cleaning out pens and brushing the goats and sheep! 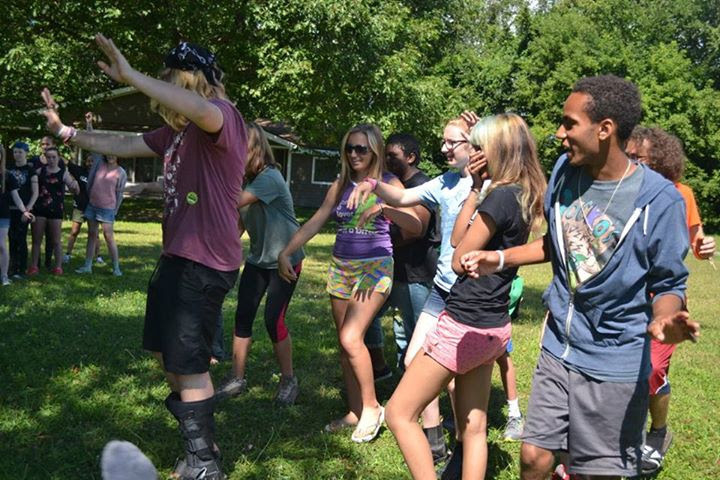 Reading this account of Amanda’s experience at YEA Camp was so inspiring to us! If you feel the same and you’re 12-17, or you know someone who is and would love YEA Camp, now is the time to get registered! Find out all the dates and details at www.YEACamp.org.